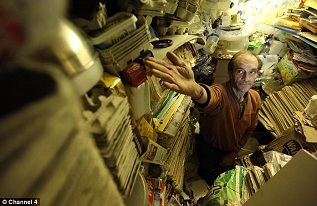 Last week I watched a British Channel 4 documentary about a chronic hoarder named Richard Wallace. Fascinating stuff. This was a man who hadn't had a bath in years because his bath, like everything else in his house, was covered to the ceiling in piles of collected junk. To get from one room to the next he would have to swim over the top of his junk pile, ducking under the top of the doorway. And yet he was a fairly normal guy. 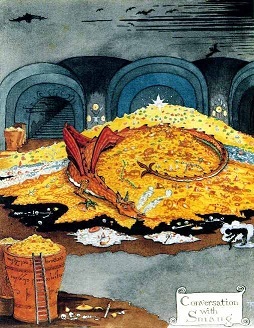 He wasn't like some angry Smaug, fighting to protect his golden hoard. He had a well developed sense of humour, and you could carry out a normal conversation with the guy. Yet he had a profound lack of insight. Despite his incredible existence (he slept in a chair, his bed was covered in ceiling-high junk), he didn't see see that he had a psychological syndrome. Pay attention to this, because it's kind of the point: He didn't believe he had an excessive hoarding habit, he felt his real problem was a shortage of storage. I think what scared me was that he was a little like me. Or a little like you. So it got me thinking about my own hoarding tendencies. Instead, there is a completely different form of hoarding I engage in, that has gotten out of control. The thing I collect is incomplete projects. Unfinished work. My list of incomplete projects is my own personal crazy hoard. To get from one task to the next, I need to swim over the ceiling-high pile of incomplete tasks, stacked up from every stray project idea I've ever had. Like a crazy hoarder I mistake the root cause of my growing mountain of incomplete work. The hoarder thinks he has a storage problem (when he really has a 'throwing things away problem'). I say I am 'time poor' as if the problem is that poor me is given only 24 hours in a day. It's more accurate to say... what exactly? It seems crazy for a crazy person to use his own crazy reasoning to diagnose his own crazy condition. Maybe I too easily add new projects to my list, or I am too reluctant to exit from unsuccessful projects. Perhaps I am too reluctant to let a task go, to ship what I've done. They're never perfect, never good enough. And I know I'm not alone in making the easy claim that I am 'time poor'. So many people claim to be time poor, when really we are poor at prioritizing, or poor at decisiveness, or don't know how to say 'no' (...to other people, to our own ideas). If only I had a hidden store of time, or if only I had magical organisation tools, or if only I could improve my productive throughput, then, only then would I be able to get things done, to consolidate the growing backlogs and todo lists into one clear line of work, and plough through it like an arctic ice breaker carving its way through a sheet of ice. So I have to declare todo bankruptcy. Throw everything out and start again. First up, a lot of projects have moved from the maybe pile to the 'never no way' pile. 'Cop Dog Buddies' -- movie script about two mismatched police dogs thrown together to hunt down their masters' killers. 'Registry on Rails' -- the web development framework from hell. OCD-targeted one-page website "have i left the iron on?" A life-sized full-body tattoo of my own body, all over my body. Twee -- a micro-blogging service where posts can only be three words long and must be valid dictionary words in your language. 'Vampurr' trilogy -- epic love-triangle between goth-girl tattooist, ear-stretching vampire and shape-shifting battle-cat. Word as a database -- it's Word. As a database. 1. Put out NimbleText 1.6. People have been nagging me about this for a while, and it's pretty much ready, if I can just stop distracting myself with all the other craziness.